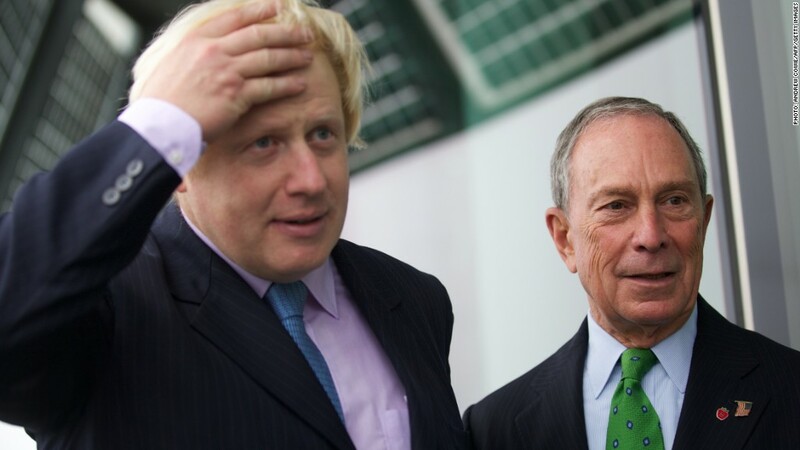 London mayor Boris Johnson is being pursued by U.S. tax officials. His former New York counterpart Michael Bloomberg was given an honorary knighthood by the Queen last month. The mayor of London is probably regretting keeping his U.S. passport: He's being pursued by officials over an unpaid tax bill. Boris Johnson was born in New York and still has U.S. citizenship, despite leaving the country when he was five years old. On a recent visit to the U.S. to promote a book, Johnson told NPR that officials were "coming after him" for capital gains tax on the sale of his first London home. The Daily Telegraph said the mayor owed more than £100,000 ($160,000) in tax after making a profit of £730,000 on the sale. Asked whether he would pay the bill, he told NPR: "No is the answer. I think it's absolutely outrageous. Why should I? ... I haven't lived in the United States for, you know, well, since I was five years old." His spokeswoman declined to comment further. Unlike most countries, the U.S. taxes citizens, including expats like Johnson, on all income, regardless of where they live or earn. This is not the only tax dispute between Johnson and the U.S. The mayor, known for his unruly blond hair and the occasional gaffe, has criticized the U.S. embassy for not paying the congestion charge -- a levy on vehicles using central London streets during peak weekday hours. He claims American diplomats owe more than $10 million for driving through the city center. He's even asked President Obama to pick up the bill. The U.S. embassy, along with other embassies in London, refuses to pay. They say the fee is a form of tax -- and that as diplomats, they are exempt.